If you, like me, grew up in a “Bible-believing church”, one thing that might have been discussed is the question of what role women could play in church services. You might have been told, for example, that the Bible clearly teaches women to be silent. Maybe you accept that, and can’t understand how anyone would see things differently. Maybe you no longer feel like you can accept that, but don’t know what to do with certain passages. Let me state my biases and assumptions up front. If I were studying Buddhism or Islam, and they told me that separation between men and women was an essential part of their religion (as they do), I would accept that. I wouldn’t see it as my place to challenge the traditions that had been passed down. I would recognize that within those religions, there were certain practices that might differ significantly from the outside world. And if I had decided to pursue that religion, I would be okay with that. Similarly, as a Christian, if I believed that God had commanded separate roles for men and women, I would accept that. Or if I thought that separate roles for men and women was the earliest tradition of the church, I wouldn’t see it as my role to challenge that practice. But this leads to the fundamental question: What does Christianity teach on the issue? What do the scriptures indicate was the practice of the church from the earliest times? I believe that the New Testament clearly teaches that women and men were to be given equal roles in the church, and that this practice of equality was understood as a command of God. Therefore, just as I wouldn’t consider it my place to challenge a command of God, or to change a tradition passed down, I do not consider it acceptable for the modern church to do so either. Establishing separate roles for men and women is a rejection of a core New Testament teaching, and an abandonment of one of the key distinguishing features of scriptural Christianity. Did the early Christians allow women to speak in the church? There is a lot going on here. But right here, in the very first moment of Christianity, we have a clear and unambiguous statement: The sign of Christianity was that both men and women would equally possess the Spirit of God, and equally use that Spirit to prophesy. This wasn’t incidental. This was a prophesy given in the Old Testament, and reiterated in the New Testament. It was introduced as the launching point of the New Covenant. It was God’s declaration of what he would do in Christianity. All of them would receive the gift of the Holy Spirit, and participate in this dramatic process. The promise that God would pour out his Spirit on all people, both male and female, was for them and everyone who came after them. Notice how he connects this gift to baptism? We’re going to come back to that. Prophecy is declaring the message of God, and speaking authoritatively with the Spirit of God. It is, quite simply, the most authoritative role you could play within the early church. 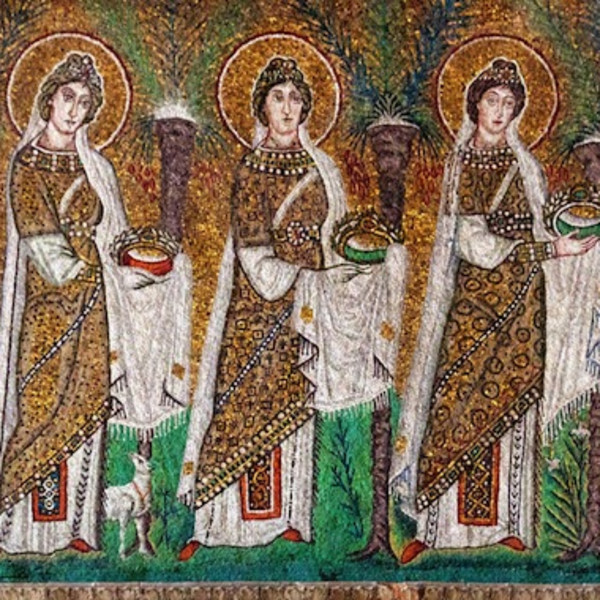 Did the early Christians allow women to speak in the church? The answer is obviously yes. It’s not just allowed, it’s an essential part of what Christianity is about. Significantly, Peter is not just saying that this would happen. He is saying it is happening! When Peter stands up, he is explaining a bizarre sight. There were approximately 120 disciples (Acts 1:15), including women (Acts 1:14), and they were all together in one place (Acts 1:15; 2:1). When the Holy Spirit is poured out, they all start speaking in the languages of people from “every nation under heaven”. The onlookers are baffled. Peter then stands up with the Eleven other apostles, and explains that these people were not drunk. Instead, “This is what was spoken by the prophet Joel…”. Peter was explaining the sight, by claiming that it could be understood by reference to Joel’s prophecy. In other words, he is explaining what they are seeing: “Sons and daughters…men and women…” — all with the Spirit, all prophesying. In front of men from every nation under heaven. Sometimes it is supposed that the only people prophesying here were the Twelve (or Eleven) apostles. This seems very unlikely. First, there are the pronouns: “they were all” (Acts 2:1) seems to indicate all the disciples, as does “these people” (Acts 2:15), while “the Eleven” (Acts 2:14) indicates when it is just the apostles. Second, about fifteen of the “nations under heaven” are listed off, strongly indicating that there were at least that many disciples speaking the various languages. Third, Peter’s statement to the crowd makes very little sense if they were not in fact seeing men and women, sons and daughters, all prophesying. If there were only twelve men prophesying, why start with a passage about how “all people” including men and women, would prophesy? Why tell the crowd that these twelve men were somehow fulfilling this prophesy about “sons and daughters”? No, Peter is describing what the crowd is seeing, and declaring that this is exactly what Joel prophesied: sons and daughters, men and women, all prophesying with the Spirit of God. Did the early Christians allow women to speak in the church? The answer is obviously yes. Did the early Christians allow women to speak in front of men? The answer, again, is obviously yes. It’s not just allowed, it’s the first thing that happens in Christianity. Objection: This was not a church service. Brothers and sisters, this was the first church service! But if somehow that were unclear, we do not have to look very hard to confirm that prophesy was an intrinsic part of what happened in the church (1 Corinthians 14:4-ff), and that women were included in that (1 Corinthians 11:5: “…every woman who prays or prophesies…”). Objection: Women were allowed to prophesy, but only in women-only church services. There is no indication in the scripture of any women-only church services. As we’ve already seen, Peter indicates that women were already prophesying to men in Acts 2. Further, Paul discusses women prophesying to men in 1 Corinthians 11:1-16, in the same context as his discussion of the Lord’s Supper. Objection: Women were allowed to prophesy, but weren’t allowed to exercise any other public role, like praying in public. In fact, we know that women exercised many other gifts and public roles, including praying in public, and that the New Testament authors applied exactly the same standards to prophecy as they did to public prayer. In 1 Corinthians 11:1-16, Paul discusses the etiquette of the mixed-gender situation in which women were both praying and prophesying. His discussion is entirely dependent on there being both men and women there, and in this scenario, he applies exactly the same standards to women who prophesy as he does to women who pray. Even the objections raised do not really dispute this—they only seek to put some qualifications on it. But such suggestions not only have no scriptural basis, they introduce countless absurdities. There is much more to discuss, and other passages to cover. But for someone who wants to honestly read the scriptures, this much is clear. Women were speaking in the church, exercising the most authoritative and powerful spiritual gift, from the earliest moments of Christianity. This fact was prophesied before Jesus, and boldly proclaimed in the first Christian sermon. It is an inescapable aspect of the New Covenant, and an unmistakeable sign of Biblical Christianity. Equal participation of men and women is a core ideal of Christianity. Equal participation of men and women was a biblical sign of God’s work. Equal participation of men and women was central to the first moments of the Christian story. Miracles and the Anthropic Principle Philosophy of information Wireheading, Faith Healing, and Why the Placebo Effect is the Most Important Thing in the World Embodiment The Three Jobs in Our Future The New God Argument and A New Apologetics Three strains of religious transhumanism Environmentalism Mandates Transhumanism How to believe in Immortality What is Technology?